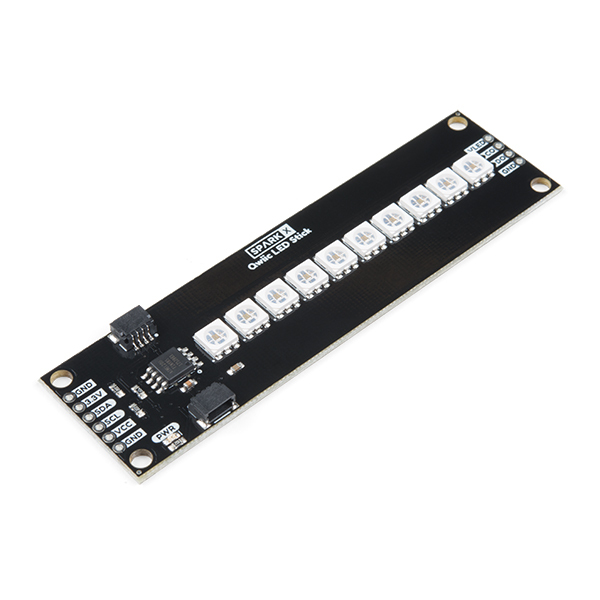 The Qwiic LED Stick features ten addressable APA102 LEDs, making it easy to add full color LED control using I2C. 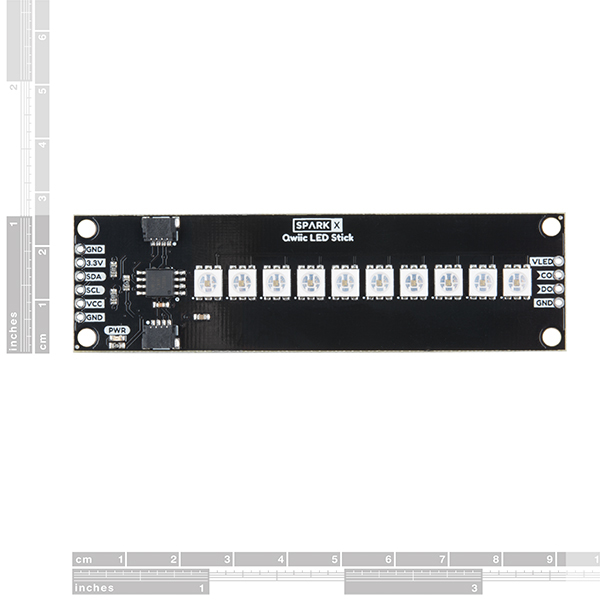 Write to individual LEDs to display a count in binary, or write to the whole strip for cool lighting effects. You can even add more LEDs to the end if you need to1. We’ve written an Arduino library that takes care of the I2C and communication to the LEDs so all you have to do is decide what color each LED should be. 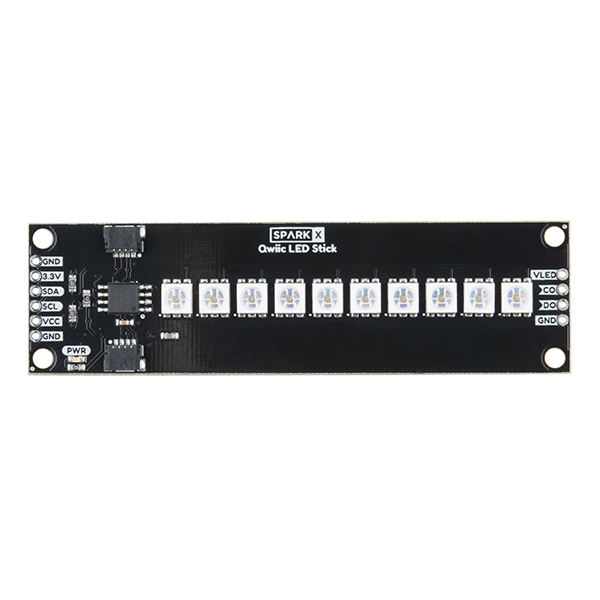 The LED Stick has a default I2C address of 0x23 but can be changed with a simple command, allowing you to control over 100 Qwiic LED Sticks on a single bus1! The address can also be changed to 0x22 by closing the solder jumper on the back of the board. 1: Using a lot of LEDs can draw a lot of current. Make sure to consider the power limits of your setup. 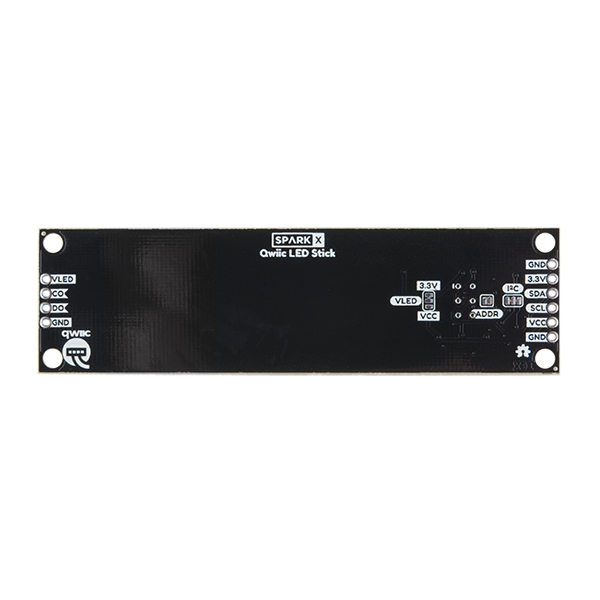 If adding an external power supply, cut the trace on the back of the board from VLED to 3.3V. If you expect more than 1A of current, connect your external supply directly to VLED. Closing the jumper from VLED to VCC will add a 4.7uF decoupling capacitor. Please visit the repo for the latest firmware and hardware designs.